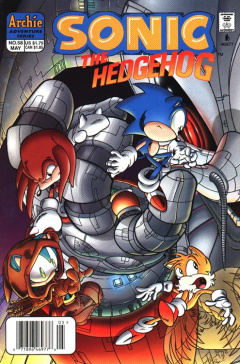 Sonic the Hedgehog 58 is the fifty-eighth issue of the Sonic the Hedgehog comic. This comic contains two stories, the main story entitled "Friendly Rogues And Foul Villains". The secondary story is entitled "Tales of the Freedom Fighters - The living Crown". Sonic and Tails awaken in a jail cell chained to the wall. An echidna named Yanar awakens on the floor below. Just as Yanar is about to introduce himself to the two heroes, two Robians pop in preparing Yanar for a trial. They laugh at the notion of a trial while completely ignoring Sonic's questions. Irked greatly he attempts to free himself, but only succeeds in knocking himself dizzy. Elsewhere, Rob 'O' Hedge jumps out of a tree, prepared to confront Knuckles the Echidna. Knuckles asks who the new hedgehog is and Rob introduces himself as the king of Deerwood Forest while showing off his acrobatic skills. Unimpressed, Knuckles mocks Rob's kind and knocks him flat. Admitting the echidna's superiority, Rob asks Knuckles if he would like to become his ally. Back in jail, echidna Yanar asks Sonic how he and his fox companion got here. Sonic tells him that they got caught in a bout with some bad weather, barely managing to land safely and passing out. When he awoke he was met with the ugly visage of a Robian who captured them while they were unconscious, believing Sonic to be Rob. Sonic claims he was too disoriented to fight and thus they ended up in their current predicament. Yanar reciprocates by telling his own story. He is part of a lost tribe of echidnas wandering the planet in search of a new home. They ran into these Robians, who forced them into slave labor. Sonic is taken aback by the idea of echidnas living anywhere but Angel Island, but before Yanar can elaborate the two robians return to take Sonic away, still convinced he's Rob. Yanar jumps at the robians saying he's the more dangerous one, but they overpower him. They drag Yanar outside, unaware that his sudden lunge was an attempt at their keys, which he then tosses to Sonic. Sonic catches them with his sneaker, transfers them to his mouth and uncuffs himself. Back in Deerwood Forest, Rob explains to Knuckles that all his merry men were captured and roboticized by High Sheriff, Dr. Robonik's sub-boss in the land of Mercia. Knuckles asks Rob if he's seen a lost tribe of echidnas. Rob has not, but he and Knuckles ascend to a tree top to look out for them. They see some echidnas battling robots deeper in the forest, prompting Knuckles to take action. Back in jail, the robians come in again to take Sonic to the High Sheriff. But Sonic is now free of his chains, and he proceeds to take the robots out. He rushes to find Tails, and sees him being tickle-tortured by the High Sheriff, whom Sonic recognizes as Antoine D'Coolette's father. Lamenting that the former General must have been captured and roboticized years ago, he springs into action and frees his sidekick. Sonic turns his attention back towards the High Sheriff and former General, trying to spark his memory by namedropping Antione and his lost title. The High Sheriff is unfazed at Sonic's verbal exchange. He strikes at the hedgehog hard with an axe, saying that he owes his life to Robotnik. He draws a sword, ready to strike. But Sonic doesn't want to attack Antoine's father, so Tails searches for an alternate solution and finds one. He unties the chandelier above knocking the High Sheriff out. The duo retreat, hoping to find a quick way out. Back in Deerwood, Knuckles and Rob confront a cloaked stranger on a log bridge. Rob tells Knuckles to hang back and demands that the stranger stand and deliver. The stranger quickly disarms him and knocks him into the river. Knuckles realizes that she's Mari-An of the lost tribe. Mari-An uncloaks herself and helps Rob out of the water. Rob and Mari-An introduce themselves shyly, but Knuckles calls to their attention more important matters. Mari-An asks where her missing brethren are, where Knuckles points to Sonic and Tails' abandoned bi-plane, but Rob doesn't recognize those names. The three then proceed to head toward the High Sheriff's castle. Back in the castle, Sonic and Tails run about trying to find a way out. The castle is a maze, and they think they're just running in circles. Sonic proceeds dispatch a chasing robot. Back outside, Knuckles, Rob and Mari-An make their way to Friar Buck's chapel. Once inside, Rob reveals a secret passage into the castle underneath a podium. They enter the castle, only to stumble upon Sonic and Tails. Sonic remarks at Rob's resemblance, prompting Rob to recognize Sonic and Knothole Village as the place where he long ago sent his cousin Amy Rose to safety. Sonic is confused, but Knuckles interrupts the exchange of information by leading them to a balcony, where they now witness Yanar about to be executed by the High Sheriff. The second story begins in an examination room, where King Maximillian Acorn is being examined by Doctor Quack. Quack wishes to understand how the spirit of Ixis Naugus was driven from the King's body. Quack then asks the King to cough. The King complies, but insists that all this testing is unnecessary, as he can explain how Naugus was driven out. Relenting, Quack brings out a chair and allows the King to tell his tale. In a flashback, a ten-year-old Max is escorted by his father, King Frederick, to a place within the palace where the mysterious Source of All lies. Frederick explains that the shimmering metallic pool is the source of their power, and encourages young Max to bathe in it. Young Max goes in, then emerges covered in the liquid-metallic substance. The substance is drained from his body, and molded into the Sword of Acorns. Mex then reveals to Quack that, while he wasn't aware of it then, he had been bonded to the Source of All. Max elaborates on what the Source of All is, which then leads Quack to inquire about the sword and crown. In another flashback, Max tells of an omen the Source gave while he was fighting off Robotnik in the coup, telling him to instruct sisters Rosie and Julaya to take the sword, as well as Sally and her friends away to fight another day. Max is caught and taken before Robotnik, who demands the crown, but it has faded upon being separated with the sword. Frustrated, Robotnik sends him into the Void where, due to losing the sword and crown, the King is unprotected from Ixis' magic. This caused his initial crystallization, but now that the sword and crown are reunited, he is protected once again. Now fully healthy, Max begins plans for his daughter, Sally. This is the first appearance of Antoine's father, General D'Coolette. This is the first appearance of Rob 'o' Hedge. This issue introduces the Source of All. Rob reveals that he is Amy's cousin, to date the only known member of Amy's family. While dizzy after attempting to escape chains, Sonic remarks that he sees birds and stars "in marshmallow greens and marmalade skies" a reference to the Beatles song "Lucy in the Sky With Diamonds".